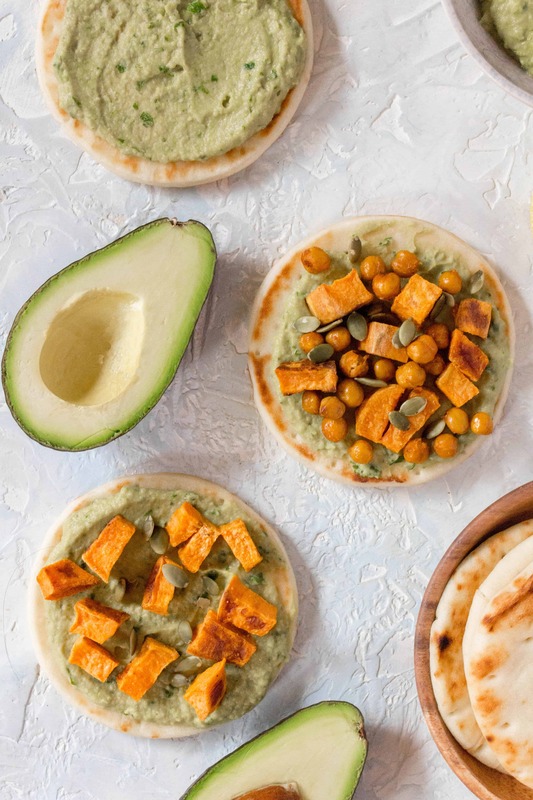 This Creamy Avocado Hummus with Roasted Chickpeas and Sweet Potato on Mini Pitas are the perfect grab and go lunch. Disclaimer: This recipe was made in partnership with Avocados from Mexico. Thank you for supporting the brands who support me to make this blog possible. If you follow me on Instagram (@CarmysHungry), then you would know that I spent 95% of December drinking bubble tea and eating ice cream. I have definitely gotten softer and rounder during the holidays so it’s no surprise that H and I are back at the gym in January working our tushes off because we’ve noticed a dip in energy levels thanks to the whole month of sugar. 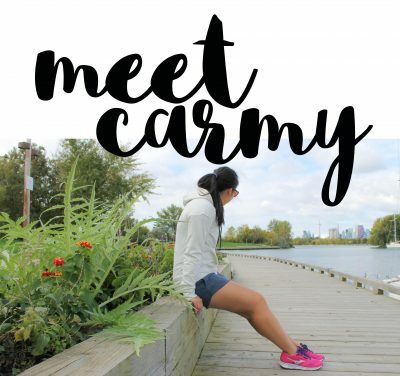 As we are spending more time working out again, I wanted to make sure we were fuelling our bodies properly. 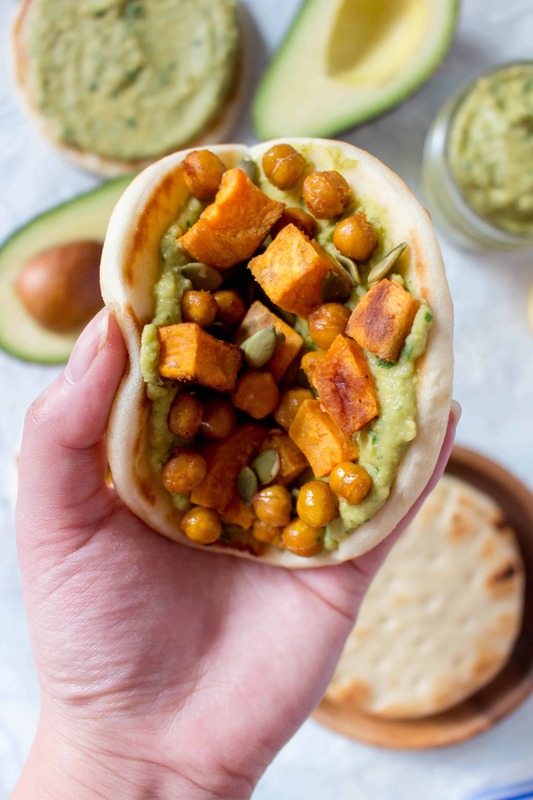 That’s where this delicious Creamy Avocado Hummus with Roasted Chickpeas, Sweet Potato, and Pumpkin Seeds on a Pita comes in! It’s a mouthful isn’t it?! But as I was saying, I wanted something light but filling for lunch so we could be properly fuelled to hit the gym and not feel weighed down while working out. And boy does this recipe hit the spot, especially the creamy avocado hummus. Avocados are filled with healthy fats and as a bonus, they contain more potassium than bananas which is great to keep calf cramps away while doing cardio. When testing this recipe, I was eating spoonfuls of the avocado hummus, it is that good. You’re not going to be able to go back to regular hummus after trying this one! Slice your avocados and wash your cilantro, set aside. 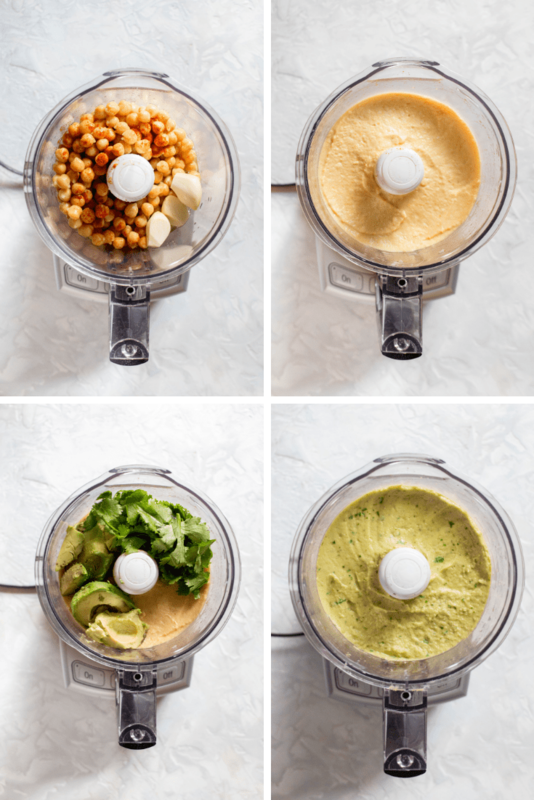 In a food processor, blend together the chickpeas, garlic, salt, paprika, lemon juice, olive oil, and some of the liquid from the chickpeas. Once smooth, add in the avocado and cilantro. Blend until smooth. In a 400F oven, roast the chickpeas and sweet potato (tossed in olive oil, and 1 tbsp total of your seasoning of choice ie salt/pepper/garlic powder) for 30-35 minutes. On a pita bread (toasted or as is), spread your creamy avocado hummus. Top with the roasted chickpeas and sweet potato in addition to a pinch of pumpkin seeds (or seeds of your choice). 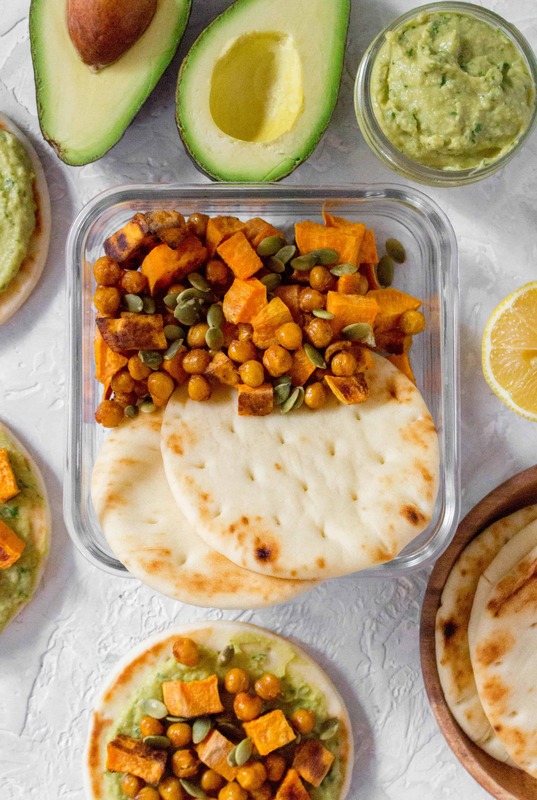 If meal prepping in a container, place the avocado hummus in a small airtight mason jar or container, and the pita bread with chickpeas/sweet potato/pumpkin seeds in a separate container. skip roasting the chickpeas and swap the sweet potato for something like broccoli, peas, or carrots to skip on the oven cook time. 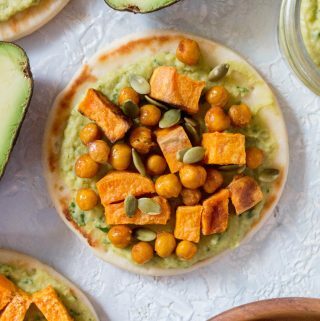 mix your hummus with the roasted chickpeas, sweet potato, and pumpkin seeds before putting it in your meal prep container to if you don’t want to spend time spread the avocado on the pita bread before eating. Slice up 2-3 avocados and set it aside with your cilantro. Once smooth, add in the avocado and cilantro. Blend until smooth again. In a 400F oven, roast the chickpeas and sweet potato (tossed in olive oil, and 1 tbsp total of your seasoning of choice ie salt/pepper) for 30-35 minutes. 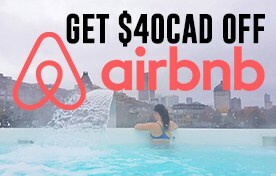 Want to win $1,000 in groceries? Click here to tell Avocados from Mexico what’s in your lunchbox/your favourite avocado recipe to enter! Now this is my kind of recipe. I can eat hummus by the spoonful…and often do. This is the perfect wrap for lunch or dinner, and I know hubby would love this too. 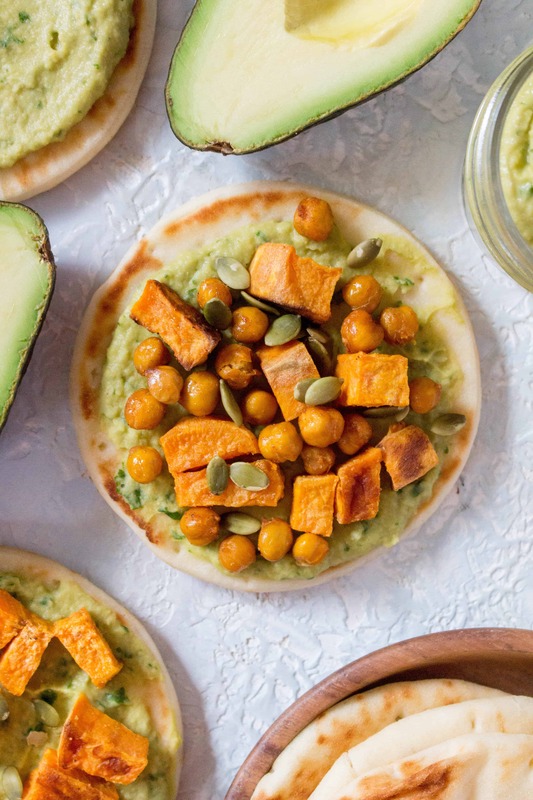 I’m glad to hear that I wasn’t the only one to get softer and rounder over the holidays 🙂 This avocado hummus with roasted chickpeas and sweet potatoes sounds like the perfect way to get back on track. So delicious and easy to make! This sounds so good I good eat it with a spoon! I love that you roast the chickpeas before using them. Roasting brings out so much flavor! Add in those gorgeous avocados and wow! What a great, healthy meal to fuel a workout! All those great fats, protein, and nutrients. Just what I need to help with my own softer and rounder issues from the holidays. 🙂 And I love the avocado hummus. Yum! All hummus is great, but the creaminess of the avocado is especially great.